Joy and euphoria hang over the border district of Mchinji when Malawi switched on the Chipata-Mchinji 33kV power line as part of interventions to deal with power challenges besetting the country. 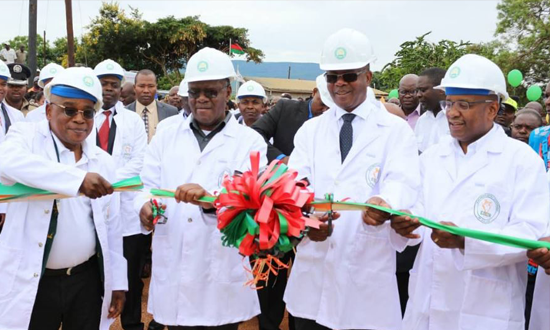 Presiding over the ceremony, Minister of Energy, Natural Resources and Mining, Honourable Aggrey Masi, MP could not hide his excitement at the event which was also witnessed by his Zambian counterpart, Honourable Matthew Nkhuwa, MP. Honourable Masi said the project, which gives Malawi 20MW of power, resulted from high-level talks that President Professor Arthur Peter Mutharika had with his Zambian counterpart, President Edgar Chagwa Lungu. “Let me also appreciate the kind gesture that the Government and the people of Zambia have extended to us. Because of the kind consideration of our brothers and sisters from Zambia, the discussions to have a power interconnection agreement have been smooth,” said Honourable Masi about the project whose Power Purchase Agreement was signed in August 2018. But the Minister said Malawi would still continue to develop its own generation plants in renewable energy, besides hydro generation, to ensure sustainability through energy mix. “We shall continue to pursue the road map that ESCOM has developed to harness all these interventions in order to provide reliable power to our people,” he said. Speaking on behalf of his delegation, Honourable Nkhuwa pledged his government’s commitment to help Malawi to get out of its power challenges. “We also appreciate that ESCOM has been powering Lundazi and Chama when ZESCO could not. We are constructing lines to these towns and this will help ESCOM to have the power it used to send to our towns for use within Malawi,” he said. ESCOM Chief Executive Officer, Allexon Chiwaya also said besides local interventions, ESCOM will have a 132kV line from Chipata to Bunda, another line from Chipata to Nkhoma and a 400kV line from Mozambique to Phombeya. “This is in line with the Southern African Power Pool (SAPP) arrangement that countries should share energy resources. This will also help to connect SAPP to the East African Power Pool through Bwengu in northern Malawi via Tanzania,” Chiwaya said. The Chipata-Mchinji project is expected to run for five years subject to renewal.